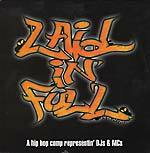 "This fully mixed CD/LP equally presents the hip-hop DJ and MC. M-Boogie dices 28 tracks of MCs spittin' and DJs cuttin'." Features: M-Boogie with KRS-One, Iriscience & DJ Babu, Bedroom Produksionz, Kut Masta Kurt, DJ Revolution, Dignified Soldiers, Planet Asia & 427, DJ Dusk, Lootpack, N'Dea Davenport feat. Mos Deaf, Innernational, Rip One, Senoj & J-Heat, DJ Rhettmatic, Insane Poetry, Joey Chavez, DJ Spooky w/ Kool Keith & Sir Melenik, Mr. Supreme w/ Al'Tariq, Missin' Linx. Last copies of this 1999 release, reduced price.